Happy Opening Day! The March 2012 Latest Leaders rounded into fine form as Spring Training wound down. We have a number of rookies making their debut on this list, like TribeVibe and 3 Up, 3 Down, as well as some very familiar names. Celebrate the new season by discovering some new blogs! 29. You’re Killin’ Me, Smalls! Welcome to Nationals Hill — just in time for the first-ever game at Nationals Park! Updates/fixes are ongoing to the new MLBlogs Network and please keep the feedback coming here in comments. We are watching them closely and incorporating user input. We just changed the default comment settings to “Anyone Can Comment” (instead of None, which would require approving first) and Email Notifications on. I’ve been told by the Movable Type folks that you should try using the links in that email to moderate comments. It’s a cool feature, especially when you want to edit or revise an aggressive commenter. Again, this is just a default settings change system-wide. We’ve been seeing a performance issue on many static pages and a new bug has been filed with Six Apart on that one. Load times will improve. Tag cloud and Most Recent blog headlines on the MLBlogs.com landing page are being worked on. So is the Edit Assets functionality in the MT software. Reminder to add as many related tags as possible in that area beneath your text field. This is how a lot of people are going to find you. It’s one of the best changes from the old MLBlogs. We’re going to deploy a fix in the morning to rebuild the sidebar more aggressively. This way new linked lists will show up much more quickly (along with revised info pics). There are many known issues out of the gates and a team is in motion on them. Adding a ton of widgets (ie counters, weather bugs, chat rooms, etc.) is not advised, according to our Movable Type partners. Do so at your own risk, as was the case with the past iteration of MLBlogs. They often decrease performance on MLBlogs pages, and in some cases I had no desire to click on the MLBlog because it took a year to load. We have done our best to migrate over all Typelists, and it is not surprising that some or many of these widgets have been lost in the transition. One user said he “paid for those,” meaning it was somehow part of the past subscription fee at MLBlogs, and that is false. Third-party widgets are not presented in the software for a reason. Not saying to avoid them, but they’re basically a hack to your software and widgeter beware. If you have a major individual issue, a handful of us have “superuser” admin rights and can assist in changes. As I’ve noted, please also be patient through the Opening Day whirlwind activity. 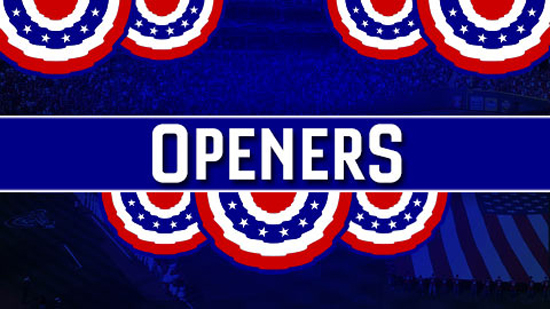 About to write another MLB.com Opening Day pageantry story now myself, as I know most of you are doing. Good luck to 30 Major League Baseball teams that are about to all be under way in the regular season, and good luck to all of you who are going to blog hopefully through the World Series and beyond. And check out my story: How Does It Feel?